The color of roasted beets is only one of the beauties of them. 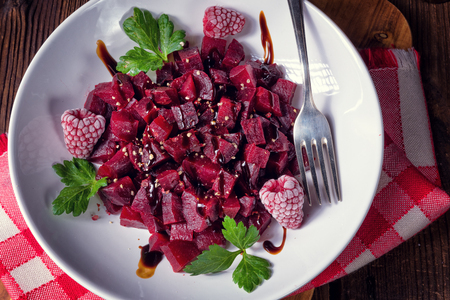 Beets are rich in antioxidants (from that beautiful beet color) which help to purify and detoxify the liver. When in season they are slightly sweet, a little earthy, and perfect for a meal or snack. Just like the Lays potato chip, you can’t eat just one. I like to cut them up and coat them with balsamic vinegar and a sprinkle of salt for a delicious treat! If the beet still has the greens on them, slice them off. With a potato peeler, peel the beet, just as you would a potato. Be careful, as the beautiful beet color will stain your hands, clothes, and cutting board. You may wish to wear gloves so it doesn’t look like you’ve been to the butcher shop. Slice the beets into bite-sized pieces and place them into a bowl. In a separate small bowl, whisk together the balsamic vinegar and oil. Pour the vinegar/oil mixture over the beets. With your hands, toss the beets with the vinegar and oil mix until they are well coated. Line a cookie sheet with parchment paper. Arrange the beets on the cookie sheet so they are close, but not touching and overlapping. Roast the beets for 25-30 minutes or until they are easily pierced with a fork. When you remove them from the oven, lightly sprinkle them with salt and enjoy warm. As an FYI, the beautiful beet color will follow them all the way through the digestive tract, so don’t be alarmed. Actually you can use it to your benefit, check it out here.